Tearing, rending. Claws fly as two beasts collide in a savage feast. Thirsty snarls in the darkness and guttural screams. Fangs scissor flesh. A blur of fur and wool. And blood. Lots of blood. One animal is pinned. Teeth lunge for her throat. She struggles and bites and somehow squirms her way free. Pain and terror pump through her veins, working her limbs because she no longer has any control over them. Mindless panic drives her heart and body, whipping her across the plain. Red gushes from the wound in her flank, red with the smell of iron, staining the grass blades. Leaving a trail. Fear-blinded, she doesn’t know if her enemy is giving chase. She just runs and runs and runs, on and on, up the slope towards the dark wall of trees. As though there are jaws snapping at her tail. As though the beast’s snarls still rumble loud in her ears. Where all she can really hear are the hammer-blows of her own pulse. She dives into the woods, into the thicket and brambles and clawing branches. She has no idea if the crash of undergrowth is her own doing or the beast coming after her. Maybe, just maybe, the forest will rip her to shreds and scatter her among the shadows. Lost to whatever may – or may not – be a scant breath behind her. They milled and jostled about in the long grass and generally did nothing out of the ordinary for sheep. A bell clanged dully, hanging from the neck of the rather princely ram who led them in their aimless meanderings. They were clouds fallen to earth, with as much ability to steer their own course as they’d had in the sky despite the addition of legs and a simple brain. The flock was perhaps a little nervous of Genghis’ trusty mount but that was to be expected given the animal’s stature. Genghis had taken care to dismount many yards away but and Bogdo stayed his ground, but he cast a long shadow in the flock’s direction and they steered well clear of it. Perhaps they were also intimidated by the stern exterior Genghis liked to maintain. It was difficult to tell with sheep. Stupid creatures – and invaluable. Genghis had a way of sharpening his eyes like arrowheads, ready for shooting at people. That was the way his mother had always described it anyway, whenever she was remarking on how he was such a serious boy and how he should go out and run and play games with the other boys in the tribe. Chiefly, he always suspected, because she wanted him out of her way so she could tidy up the yurt. That was a distant time, even if this valley lay not so very far from the lands where his people had camped in the summers of his youth. He had never grown out of that seriousness. If anything he had grown into it – or it had grown into him, taken root. He directed it at the shepherdess and found her attitude unsettling. It was like shooting arrows at a stone wall. She stood as though she had grown up from the plains. A wise old crag standing guard at the entrance to her tent. “Where did you hear that?” she said, almost affronted as though he had accused her of an affair with the chieftain from the neighbouring hills. It seemed unlikely: she had a face like a purse made of camel-hide. All tanned and creased from having weathered a few too many Fargolian winters. She was heavily bundled in leathers and furs and there were plentiful threads of grey woven into pigtails that looked to have been plaited when she was a little girl. Like raisins, her eyes had seen too much sun – and more besides. And Genghis knew he was going to have a tough time convincing her of werewolves. He had trouble believing in such mythical creatures himself. They were frivolous, fireside stories. Old wives’ tales. And now, here he was, telling tales to one of the original ‘Old Wives’ who had probably first dreamed them up. Genghis sighed. This kind of wisdom was unhelpful. And it was precisely the kind that elders of every tribe dearly loved to dish out. How could the old crone tell? Genghis studied the flock. No wonder some people fell asleep counting the creatures. It was like trying to count leaves blown about in a strong breeze. He looked to the rolling hills, the ridgeline crested with trees. Bogdo was constantly glancing in that direction, probably hungry for some good grazing befitting an animal of his illustrious height. He looked resplendent in his full barding, the chainmail gleaming in the morning sun. He had little to fear from wolves or any menaces the trees might conceal, but if there were monsters skulking anywhere in this region then that forest would seem the first place to search. Arrogance. Courage in abundance, yes, but arrogance. Like so many young warriors. Always convinced they had no more to learn. This one, granted, had more age in him than most of similar years. The shepherdess watched him mount his wargiraffe in one smooth, athletic motion. He would find the blood trail in the grass. But he would find no werewolves, she was sure of that. They were too careful for that. Too old to be caught by one so young. Every story needs a hero. Perhaps, she admitted silently as she watched him ride away, up the gentle gradient towards the forest. But I fear, brave warrior, this tale will not be yours. By way of kicking off this year’s series of Tortenschloss Chronicles, we’re going to be experimenting with a new approach. Essentially they’re a set of dice, nine in all, with the face of each cube bearing an image designed to be a trigger for the imagination. The idea is you roll them, pick out one picture as your starting point and proceed to tell a story using the nine images. Simple! My randomly determined set of images are depicted above – and listed below. Make of that what you will, say the dice. My mission – and I’ve chosen to accept it – is to write a story built around that lot. 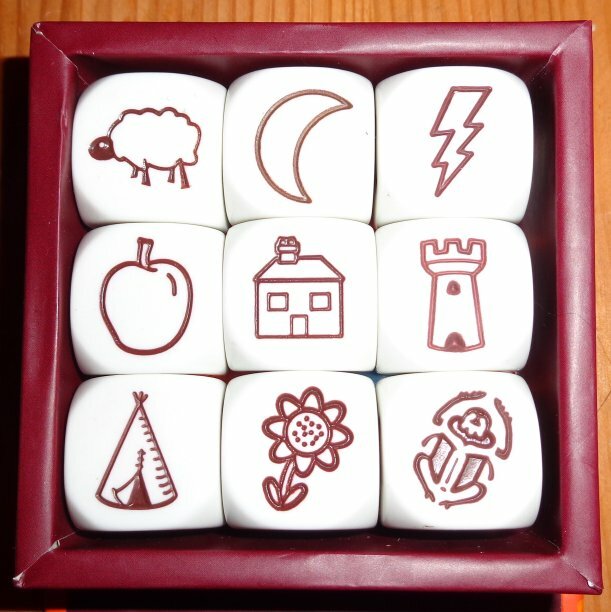 I’d never encountered these cubes before but received a set as a Christmas gift, so it struck me as a fun idea to have a go at applying them towards the creation of some Tortenschloss tales. I’ll be writing the first instalment of the first story over this weekend and, inspiration willing, will post it on Monday. Then we’ll see, as always, where the story takes us. Should be an entertaining challenge. Alternatively, rather than remain a passive spectator, feel free to dash off your own stories using the same set of images for your inspiration. Join us on the journey and embark on journeys of your own. Bon voyage. 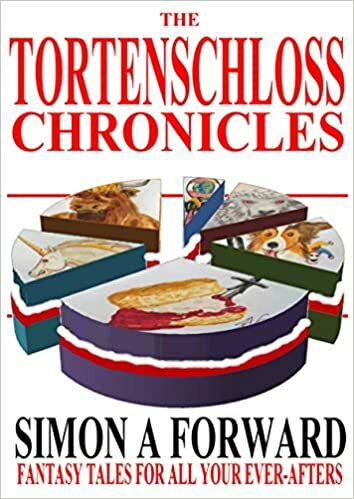 And regardless of whether you’re a reader or a writer or both, I hope you enjoy the coming year’s batch of Tortenschloss Chronicles.